You may have seen these barcode squares on product packaging, in magazines or on our print publication. The barcodes act as image-based hyperlinks and are known as Quick Response Codes or QR codes. In order to scan a QR code, you will need a smart device with a camera and an app to interpret the data in the code. A quick Google search can give you a list of free options to suit your device. Once scanned, the QR code will redirect you directly to whatever is embedded in the data — in our case directly to our website. It takes literally 1 minute for someone with an iPhone or Android phone to find and install the reader. See links below. Happy scanning. To scan a QR code or barcode simply open the app, point the camera at the code, and you’re done! There is no need to take a photo or press a button. The app will automatically recognize any code your camera is pointing at. When scanning a QR code, if the code contains a website URL, you will automatically be taken to the site. If the code just contains text, you’ll immediately see it. For other formats such as phone numbers, email addresses, or contact info, you will be prompted to take the appropriate action. This app is designed for both iPhone and iPad. 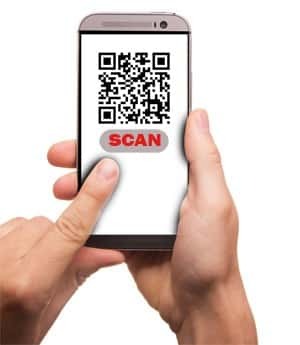 The most simple & easy QR Reader – 100% FREE.